Well, who would have thought it? 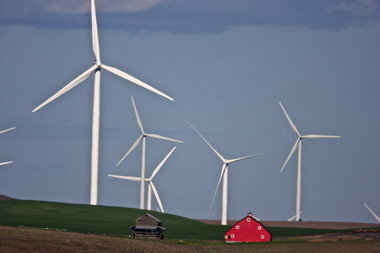 All that investment in wind power in Oregon and Washington now turns out to be too much, at least for now. The Bonneville Power Administration says it is generating so much hydropower that it won't be able to buy the output of wind farms. Turns out that the predictions of the global warming experts -- less snow -- did not apply for this past winter and spring. The Columbia has so much water coming down that the turbines have to be churning away at full tilt. Spilling the water over the dams is not allowed because it would supersaturate the water and hurt various species of fish. And there is no capacity in the transmission grid to ship the extra power somewhere else, even if "somewhere else" needed extra power. All this may tell us something about the merits of planning by government policies instead of practical considerations. The push to alternative energy sources is the result of policy choices, made mostly by Democrats in Salem, Olympia and Washington, D.C. The governments have been lavishing benefits on the wind power industry. The utilities have played along because new laws put them under pressure to generate a set percentage of electricity from alternative sources by 2025. But nobody evidently thought this through. Well, not exactly nobody. Pacific Power, for one, has been asking the feds in Washington -- apparently without success -- to accelerate the approval of new transmission lines in order to carry the output of all these new wind farms the government has wanted the utilities to build. None of this would be a problem if the utilities had been left alone in planning for the future power needs of their respective territories. They would have built plants and lines as they were needed, assuming the regulations allowed them to do so. Instead they got hammered into a drive to build wind farms that now are not as useful as they appeared.